Multiple Sclerosis (MS), the most common neurological disease of young adults, is an inflammatory, T-cell mediated (Goverman, 2009) autoimmune disease of the central nervous system (CNS) that can lead to substantial disability in affected individuals (Rodriguez et al, 1994). MS causes nerve cell demyelination and destruction of oligodendrocytes, neurons and axons (Dutta and Trapp, 2007, and Frohman et al, 2006), with varied clinical presentation and undefined etiology. Clinical manifestations include symptoms of upper motor neuron disease such as hyperreflexia, ataxia, spasticity and visual defects (Keegan and Noseworthy, 2000, Frohman et al, 2006, and McFarland and Martin, 2007). Evidence of lower motor neuron disease, such as sensory defects and partial or complete paralysis, are also sometimes observed. 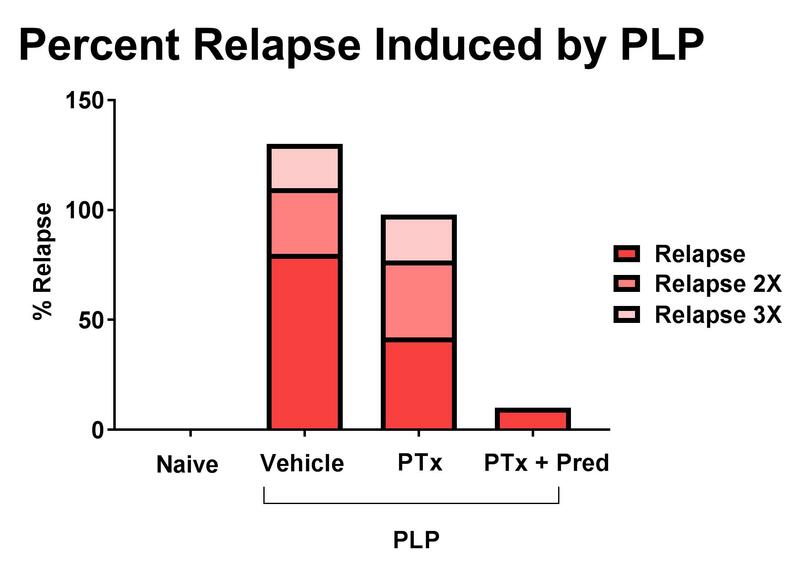 Most patients demonstrate a relapsing-remitting disease course; however, disease will transform to a chronic progressive stage over time in many patients, and 10-15% present with disease that is progressive from onset (Frohman et al, 2006, Sospedra and Martin, 2005, and Steinman, 2009). There is no cure for MS, and though there are FDA-approved treatments for relapsing-remitting and chronic-progressive variants of disease, no such therapies exist for patients who present with acute illness (Goldenberg, 2012). CD4+ T cell mediated Experimental Autoimmune Encephalomyelitis (EAE) is the classical animal model of MS, and stimulation of an immune response against CNS antigens is the underlying mechanism of EAE. This immune response can be induced by active induction, in which animals are immunized with purified or recombinant myelin proteins, or synthetic peptides derived from these proteins, emulsified in Complete Freund’s Adjuvant (CFA); or by passive induction, in which lymph node cells from animals immunized as described above are adoptively transferred into naïve animals. Once EAE is induced, animals develop either acute or chronic progressive forms of the disease. The progression of the disease is evaluated and scored with a 5-point scoring scale that evaluates muscle tone in the tail and limbs. 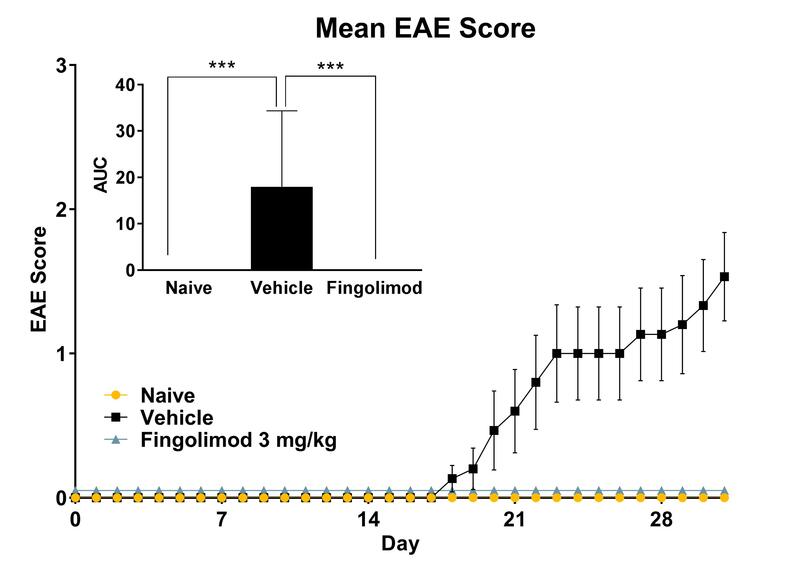 Chronic EAE is induced in C57Bl/6J mice by immunization with a myelin oligodendrocyte glycoprotein (MOG)- derived peptide emulsified in Complete Freund Adjuvant (CFA). MOG-immunization is followed by Pertussis toxin administration, which is hypothesized to facilitate immune cell crossing of the blood-brain barrier. Active EAE induction with MOG peptide results in ascending flaccid paralysis that begins with a limp tail and progresses to hind and forelimb paralysis. Inflammation is typically localized to the spinal cord, though optic nerve inflammation is also sometimes observed. Treatment with Fingolimod HCl (FTY720) protects against development of EAE, and can be included as a positive control in study designs. Most MS patients demonstrate a relapsing-remitting disease course, characterized by bouts of disease in between partial or complete remissions. Relapsing EAE is induced in SJL/J mice by immunization with a proteolipid protein (PLP)- derived peptide emulsified in CFA. 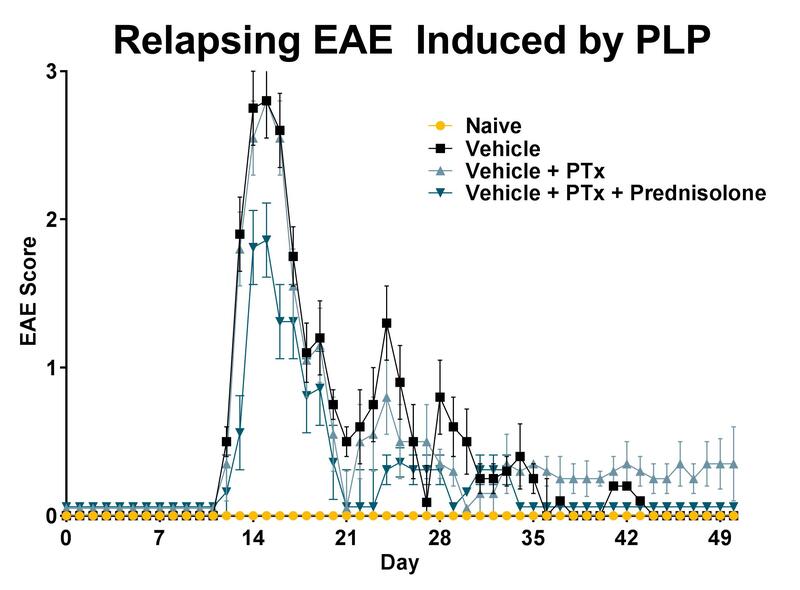 Active EAE induction with PLP peptide results in ascending flaccid paralysis that begins with a limp tail and progresses to hind and forelimb paralysis. Animal remission is observed, and followed by a relapse in symptoms. Relapsing is defined as an increase of at least one grade in clinical score for at least two consecutive days after remission.